Knesset chairman invites all party heads for discussion Wednesday morning to establish date for snap elections, after coalition breaks up. 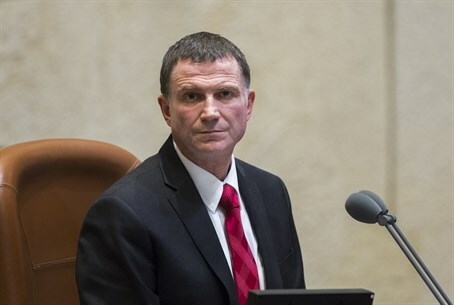 Knesset Chairman MK Yuli Edelstein (Likud) on Tuesday night invited all Knesset party heads to his office Wednesday morning at 10 a.m. to set the date for snap elections, in a meeting even before the Knesset votes on opposition bills to disband the Knesset. The party heads will set a date between them for elections on the 20th Knesset, after Prime Minister Binyamin Netanyahu on Tuesday night disbanded his coalition government. It is expected that the elections will be held late next March, although as noted the date will be decided on Wednesday. Netanyahu on Tuesday night dismissed Finance Minister and Yesh Atid Chairman Yair Lapid, as well as Justice Minister and Hatnua Chairwoman Tzipi Livni, accusing them of attacking his government from within the coalition. In response to the move, all of Yesh Atid's ministers quit the coalition. "I turn to you tonight because in the current situation, in the current government, it is impossible to lead the nation," Netanyahu said in a national address, accusing Lapid and Livni of holding a "putsch." Yesh Atid fired back, saying "the prime minister failed in managing the state of Israel and handling the needs of the Israeli public. The hurried act of dismissing the ministers is an act of fear and confusion." Channel 2 polls indicated that if elections were held today, Yesh Atid would nosedive from 19 to nine mandates, Likud would stay the largest party at 22 and Jewish Home would come in second with 17.